Phencyclidine (PCP), also known as angel dust among other names, is a drug used for its mind-altering effects. PCP may cause hallucinations, distorted perceptions of sounds, and violent behavior. As a recreational drug, it is typically smoked, but may be taken by mouth, snorted, or injected. It may also be mixed with cannabis or tobacco. Adverse effects may include seizures, coma, addiction, and an increased risk of suicide. Flashbacks may occur despite stopping usage. Chemically, PCP is a member of the arylcyclohexylamine class, and pharmacologically, it is a dissociative anesthetic. PCP works primarily as an NMDA receptor antagonist. PCP is most commonly used in the United States. While usage peaked there in the 1970s, between 2005 and 2011 an increase in visits to emergency departments as a result of the drug occurred. As of 2017 in the United States about 1% of people in grade twelve reported using PCP in the prior year while 2.9% of those over the age of 25 reported using it at some point in their life. PCP was initially made in 1926 and brought to market as an anesthetic medication in the 1950s. Its use in humans was disallowed in the United States in 1965 due to the high rates of side effects while its use in other animals was disallowed in 1978. Moreover, ketamine was discovered and was better tolerated as an anesthetic. PCP is classified as a schedule II drug in the United States. A number of derivatives of PCP have been sold for recreational and non-medical use. 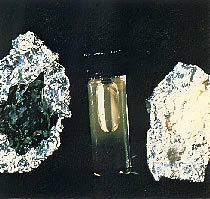 Illicit PCP in several forms seized by the DEA. Behavioral effects can vary by dosage. Low doses produce a numbness in the extremities and intoxication, characterized by staggering, unsteady gait, slurred speech, bloodshot eyes, and loss of balance. Moderate doses (5–10 mg intranasal, or 0.01–0.02 mg/kg intramuscular or intravenous) will produce analgesia and anesthesia. High doses may lead to convulsions. The drug is often illegally produced under poorly-controlled conditions; this means that users may be unaware of the actual dose they are taking. Psychological effects include severe changes in body image, loss of ego boundaries, paranoia, and depersonalization. Psychosis, agitation and dysphoria, hallucinations, blurred vision, euphoria, and suicidal impulses are also reported, as well as occasional aggressive behavior. :48–49 Like many other drugs, PCP has been known to alter mood states in an unpredictable fashion, causing some individuals to become detached, and others to become animated. PCP may induce feelings of strength, power, and invulnerability as well as a numbing effect on the mind. Studies by the Drug Abuse Warning Network in the 1970s show that media reports of PCP-induced violence are greatly exaggerated and that incidents of violence are unusual and often limited to individuals with reputations for aggression regardless of drug use. :48 Although uncommon, events of PCP-intoxicated individuals acting in an unpredictable fashion, possibly driven by their delusions or hallucinations, have been publicized. One example is the case of Big Lurch, a former rapper with a history of violent crime, who was convicted of murdering and cannibalizing his roommate while under the influence of PCP. Other commonly cited types of incidents include inflicting property damage and self-mutilation of various types, such as pulling one's own teeth. :48 These effects were not noted in its medicinal use in the 1950s and 1960s however, and reports of physical violence on PCP have often been shown to be unfounded. Recreational doses of the drug also occasionally appear to induce a psychotic state that resembles a schizophrenic episode. Users generally report feeling detached from reality. PCP is self-administered and induces ΔFosB expression in the D1-type medium spiny neurons of the nucleus accumbens, and accordingly, excessive PCP use is known to cause addiction. PCP's rewarding and reinforcing effects are at least partly mediated by blocking the NMDA receptors in the glutamatergic inputs to D1-type medium spiny neurons in the nucleus accumbens. PCP has been shown to produce conditioned place aversion and conditioned place preference in animal studies. PCP can be ingested through smoking. "Fry" or "sherm" are street terms for marijuana or tobacco cigarettes that are dipped in PCP and then dried. PCP hydrochloride can be insufflated (snorted), depending upon the purity. The free base is quite hydrophobic and may be absorbed through skin and mucus membranes (often inadvertently). Management of PCP intoxication mostly consists of supportive care – controlling breathing, circulation, and body temperature – and, in the early stages, treating psychiatric symptoms. Benzodiazepines, such as lorazepam, are the drugs of choice to control agitation and seizures (when present). Typical antipsychotics such as phenothiazines and haloperidol have been used to control psychotic symptoms, but may produce many undesirable side effects – such as dystonia – and their use is therefore no longer preferred; phenothiazines are particularly risky, as they may lower the seizure threshold, worsen hyperthermia, and boost the anticholinergic effects of PCP. If an antipsychotic is given, intramuscular haloperidol has been recommended. PCP is well known for its primary action on the NMDA receptor, an ionotropic glutamate receptor, in rats and in rat brain homogenate. As such, PCP is an NMDA receptor antagonist. The role of NMDAR antagonism in the effect of PCP, ketamine, and related dissociative agents was first published in the early 1980s by David Lodge and colleagues. Other NMDA receptor antagonists include ketamine, tiletamine, dextromethorphan, nitrous oxide, and dizocilpine (MK-801). Research also indicates that PCP inhibits nicotinic acetylcholine receptors (nAChRs) among other mechanisms. Analogues of PCP exhibit varying potency at nACh receptors and NMDA receptors. Findings demonstrate that presynaptic nAChRs and NMDA receptor interactions influence postsynaptic maturation of glutamatergic synapses and consequently impact synaptic development and plasticity in the brain. These effects can lead to inhibition of excitatory glutamate activity in certain brain regions such as the hippocampus and cerebellum thus potentially leading to memory loss as one of the effects of prolonged use. Acute effects on the cerebellum manifest as changes in blood pressure, breathing rate, pulse rate, and loss of muscular coordination during intoxication. PCP, like ketamine, also acts as a potent dopamine D2High receptor partial agonist in rat brain homogenate and has affinity for the human cloned D2High receptor. This activity may be associated with some of the other more psychotic features of PCP intoxication, which is evidenced by the successful use of D2 receptor antagonists (such as haloperidol) in the treatment of PCP psychosis. In addition to its well explored interactions with NMDA receptors, PCP has also been shown to inhibit dopamine reuptake, and thereby leads to increased extracellular levels of dopamine and hence increased dopaminergic neurotransmission. However, PCP has little affinity for the human monoamine transporters, including the dopamine transporter (DAT). Instead, its inhibition of monoamine reuptake may be mediated by interactions with allosteric sites on the monoamine transporters. PCP is notably a high-affinity ligand of the PCP site 2 (Ki = 154 nM), a not-well-characterized site associated with monoamine reuptake inhibition. Studies on rats indicate that PCP interacts indirectly with opioid receptors (endorphin and enkephalin) to produce analgesia. A binding study assessed PCP at 56 sites including neurotransmitter receptors and transporters and found that PCP had Ki values of >10,000 nM at all sites except the dizocilpine (MK-801) site of the NMDA receptor (Ki = 59 nM), the σ2 receptor (PC12) (Ki = 136 nM), and the serotonin transporter (Ki = 2,234 nM). The study notably found Ki values of >10,000 nM for the D2 receptor, the opioid receptors, the σ1 receptor, and the dopamine and norepinephrine transporters. These results suggest that PCP is a highly selective ligand of the NMDAR and σ2 receptor. However, PCP may also interact with allosteric sites on the monoamine transporters to produce inhibition of monoamine reuptake. Phencyclidine is an NMDA receptor antagonist that blocks the activity of the NMDA receptor to cause anaesthesia and analgesia without causing cardiorespiratory depression. NMDA is an excitatory receptor in the brain, when activated normally the receptor acts as an ion channel and there is an influx of positive ions through the channel to cause nerve cell depolarisation. Phencyclidine enters the ion channel and binds, reversibly and non-competitively, inside the channel pore to block the entry of positive ions to the cell therefore inhibiting cell depolarisation. Some studies found that, like other NMDA receptor antagonists, PCP can cause a kind of brain damage called Olney's lesions in rats. Studies conducted on rats showed that high doses of the NMDA receptor antagonist dizocilpine caused reversible vacuoles to form in certain regions of the rats' brains. All studies of Olney's lesions have only been performed on non-human animals and may not apply to humans. One unpublished study by Frank Sharp reportedly showed no damage by the NDMA antagonist, ketamine, a similar drug, far beyond recreational doses, but due to the study never having been published, its validity is controversial. PCP has also been shown to cause schizophrenia-like changes in N-acetylaspartate and N-acetylaspartylglutamate levels in the rat brain, which are detectable both in living rats and upon necropsy examination of brain tissue. It also induces symptoms in humans that mimic schizophrenia. PCP not only produced symptoms similar to schizophrenia, it also yielded electroencephalogram changes in the thalamocortical pathway (increased delta decreased alpha) and in the hippocampus (increase theta bursts) that were similar to those in schizophrenia. PCP induced augmentation of dopamine release may link the NMDA and DA hypothesis of schizophrenia. PCP is metabolized into PCHP, PPC and PCAA. 90% of phencycledine is metabolised by oxidative hydroxylation in the liver on first pass. Metabolites are glucroniated and excreted in the urine. 9% of the drug is excreted in its unchanged form. When smoked, some of the compound is broken down by heat into 1-phenylcyclohexene (PC) and piperidine. It takes 15 to 60 minutes for effects of phencyclidine to come into action. Fewer than 30 different analogues of PCP were reported as being used on the street during the 1970s and 1980s, mainly in the United States. The best known of these are rolicyclidine (PCPy or 1-(1-phenylcyclohexyl)pyrrolidine); eticyclidine (PCE or N-ethyl-1-phenylcyclohexylamine); and tenocyclidine (TCP or 1-(1-(2-thienyl)cyclohexyl)piperidine). Only of a few of these compounds were widely used. Other analogues of PCP include 3-HO-PCP, 3-MeO-PCMo, and 3-MeO-PCP. It is commonly mistakenly reported that PCP was first synthesized in 1926. This early synthesis, in fact, refers to the PCP intermediate PCC. 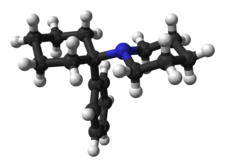 PCP was actually discovered by Victor Maddox, a chemist at Parke-Davis in Michigan, while investigating synthetic analgesic agents. Although unexpected, PCP was identified as potentially interesting, and as such, was submitted for pharmacological testing. The promising results of these pharmacological investigations led to the rapid development of PCP. It was approved for use as an investigational drug under the brand names Sernyl and Sernylan in the 1950s as an anesthetic, but because of its long terminal half-life and adverse side effects, such as hallucinations, mania, delirium, and disorientation, it was removed from the market in 1965 and limited to veterinary use. ^ a b c d Malenka RC, Nestler EJ, Hyman SE (2009). "Chapter 15: Reinforcement and Addictive Disorders". In Sydor A, Brown RY (eds.). Molecular Neuropharmacology: A Foundation for Clinical Neuroscience (2nd ed.). New York: McGraw-Hill Medical. pp. 374–375. ISBN 9780071481274. ^ Fetting, Margaret (2015). Perspectives on Substance Use, Disorders, and Addiction: With Clinical Cases. SAGE Publications. p. 145. ISBN 9781483377773. ^ a b c "NIDA InfoFacts: Hallucinogens – LSD, Peyote, Psilocybin, and PCP". National Institute on Drug Abuse. Retrieved 2018-02-19. ^ a b c d e "PCP Fast Facts". National Drug Intelligence Center. 2003. Retrieved 19 February 2018. ^ a b Riviello, Ralph J. (2010). Manual of forensic emergency medicine : a guide for clinicians. Sudbury, Mass. : Jones and Bartlett Publishers. pp. 41–42. ISBN 9780763744625. ^ a b c d e Bush, DM (2013). "Emergency Department Visits Involving Phencyclidine (PCP)". PMID 27656747. ^ a b c "Hallucinogens". National Institute on Drug Abuse. January 2016. Retrieved 20 February 2018. ^ a b Marion, Nancy E.; Oliver, Willard M. (2014). Drugs in American Society: An Encyclopedia of History, Politics, Culture, and the Law [3 volumes]. ABC-CLIO. p. 732. ISBN 9781610695961. ^ a b c Zedeck, Beth E.; Zedeck, Morris S. (2007). Forensic Pharmacology. Infobase Publishing. p. 97. ISBN 9781438103822. ^ "PCP". CESAR. Retrieved 20 February 2018. ^ "Hallucinogens". NIAD. Retrieved 20 February 2018. ^ Bunney, W. E. Jr; Hippius, Hanns; Laakmann, Gregor; Schmauß, Max (2012). Neuropsychopharmacology: Proceedings of the XVIth C.I.N.P. Congress, Munich, August, 15-19, 1988. Springer Science & Business Media. p. 717. ISBN 9783642740343. ^ a b Tasman, Allan; Kay, Jerald; Lieberman, Jeffrey A.; First, Michael B.; Riba, Michelle (2015). Psychiatry, 2 Volume Set. John Wiley & Sons. p. 4943. ISBN 9781118753361. ^ a b c d e f Morris H, Wallach J (2014). "From PCP to MXE: a comprehensive review of the non-medical use of dissociative drugs". Drug Testing and Analysis. 6 (7–8): 614–32. doi:10.1002/dta.1620. PMID 24678061. ^ Millan, M. J.; Brocco, M.; Gobert, A.; Joly, F.; Bervoets, K.; Rivet, J. -M.; Newman-Tancredi, A.; Audinot, V.; Maurel, S. (December 1999). "Contrasting mechanisms of action and sensitivity to antipsychotics of phencyclidine versus amphetamine: importance of nucleus accumbens 5-HT sites for PCP-induced locomotion in the rat". European Journal of Neuroscience. 11 (12): 4419–4432. doi:10.1046/j.1460-9568.1999.00858.x. ^ Bey, T; Patel, A (February 2007). "Phencyclidine intoxication and adverse effects: a clinical and pharmacological review of an illicit drug". The California Journal of Emergency Medicine. 8 (1): 9–14. PMC 2859735. PMID 20440387. ^ a b c d Inciardi, James A. (1992). The War on Drugs II. Mayfield Publishing Company. ISBN 978-1-55934-016-8. ^ Brecher M, Wang BW, Wong H, Morgan JP (Dec 1988). "Phencyclidine and violence: clinical and legal issues". Journal of Clinical Psychopharmacology. 8 (6): 397–401. doi:10.1097/00004714-198812000-00003. PMID 3069880. ^ Wish ED (1986). "PCP and crime: just another illicit drug?". NIDA Research Monograph. 64: 174–89. PMID 3086733. ^ Luisada, PV (1978). Petersen, RC; Stillman, RC (eds.). "The phencyclidine psychosis: phenomenology and treatment" (PDF). Phencyclidine (PCP) Abuse: An Appraisal. Rockville, Maryland: National Institute on Drug Abuse. ^ Pender JW (Oct 1972). "Dissociative anesthesia". California Medicine. 117 (4): 46–7. PMC 1518731. PMID 18730832. ^ Giannini, A. James (1997). Drugs of Abuse (Second ed.). Los Angeles: Practice Management Information Corp. p. 126. ISBN 978-1-57066-053-5. ^ Nestler, EJ (October 12, 2008). "Review. Transcriptional mechanisms of addiction: role of DeltaFosB". Philos. Trans. R. Soc. Lond. B Biol. Sci. 363 (1507): 3245–3255. doi:10.1098/rstb.2008.0067. PMC 2607320. PMID 18640924. Nestler EJ (October 2008). "Table 1: Drugs of abuse known to induce ΔFosB in nucleus accumbens after chronic administration". Philos. Trans. R. Soc. Lond. B Biol. Sci. 363 (1507): 3245–55. doi:10.1098/rstb.2008.0067. PMC 2607320. PMID 18640924. ^ Noda, Y.; Nabeshima, T. (1 September 1998). "Neuronal mechanisms of phencyclidine-induced place aversion and preference in the conditioned place preference task". Methods and Findings in Experimental and Clinical Pharmacology. 20 (7): 607–611. doi:10.1358/mf.1998.20.7.485726. ISSN 0379-0355. PMID 9819806. ^ "Fry Fast Facts". National Drug Intelligence Center. ^ a b c d Helman RS, Habal R (October 6, 2008). "Phencyclidine Toxicity". eMedicine. Retrieved on November 3, 2008. ^ a b c d Olmedo R (2002). "Chapter 69: Phencyclidine and ketamine". In Goldfrank LR, Flomenbaum NE, Lewin NA, Howland MA, Hoffman RS, Nelson LS (eds.). Goldfrank's Toxicologic Emergencies. New York: McGraw-Hill. pp. 1034–1041. ISBN 978-0-07-136001-2. ^ a b c Milhorn HT (Apr 1991). "Diagnosis and management of phencyclidine intoxication". American Family Physician. 43 (4): 1293–302. PMID 2008817. ^ Giannini AJ, Price WA (1985). "PCP: Management of acute intoxication". Medical Times. 113 (9): 43–49. ^ Giannini AJ, Eighan MS, Loiselle RH, Giannini MC (Apr 1984). "Comparison of haloperidol and chlorpromazine in the treatment of phencyclidine psychosis". Journal of Clinical Pharmacology. 24 (4): 202–4. doi:10.1002/j.1552-4604.1984.tb01831.x. PMID 6725621. ^ Berton JL, Seto M, Lindsley CW (June 2018). "DARK Classics in Chemical Neuroscience: Phencyclidine (PCP)". ACS Chem Neurosci. 9 (10): 2459–2474. doi:10.1021/acschemneuro.8b00266. PMID 29953199. ^ a b c d e f g h i j k l m n o p q r Roth BL, Gibbons S, Arunotayanun W, Huang XP, Setola V, Treble R, Iversen L (2013). "The ketamine analogue methoxetamine and 3- and 4-methoxy analogues of phencyclidine are high affinity and selective ligands for the glutamate NMDA receptor". PLOS One. 8 (3): e59334. Bibcode:2013PLoSO...859334R. doi:10.1371/journal.pone.0059334. PMC 3602154. PMID 23527166. ^ a b c Rothman RB (1994). "PCP site 2: a high affinity MK-801-insensitive phencyclidine binding site". Neurotoxicol Teratol. 16 (4): 343–53. doi:10.1016/0892-0362(94)90022-1. PMID 7968938. ^ Frohlich J, Van Horn JD (2014). "Reviewing the ketamine model for schizophrenia". J. Psychopharmacol. (Oxford). 28 (4): 287–302. doi:10.1177/0269881113512909. PMC 4133098. PMID 24257811. ^ Seeman P, Guan HC (2008). "Phencyclidine and glutamate agonist LY379268 stimulate dopamine D2High receptors: D2 basis for schizophrenia". Synapse. 62 (11): 819–28. doi:10.1002/syn.20561. PMID 18720422. ^ a b Kapur S, Seeman P (2002). "NMDA receptor antagonists ketamine and PCP have direct effects on the dopamine D(2) and serotonin 5-HT(2)receptors-implications for models of schizophrenia". Mol. Psychiatry. 7 (8): 837–44. doi:10.1038/sj.mp.4001093. PMID 12232776. ^ a b c Seeman P, Guan HC, Hirbec H (2009). "Dopamine D2High receptors stimulated by phencyclidines, lysergic acid diethylamide, salvinorin A, and modafinil". Synapse. 63 (8): 698–704. doi:10.1002/syn.20647. PMID 19391150. ^ Rabin RA, Doat M, Winter JC (2000). "Role of serotonergic 5-HT2A receptors in the psychotomimetic actions of phencyclidine". Int. J. Neuropsychopharmacol. 3 (4): 333–338. doi:10.1017/S1461145700002091. PMID 11343613. ^ a b c d Goodman CB, Thomas DN, Pert A, Emilien B, Cadet JL, Carroll FI, Blough BE, Mascarella SW, Rogawski MA, Subramaniam S (1994). "RTI-4793-14, a new ligand with high affinity and selectivity for the (+)-MK801-insensitive [3H]1-]1-(2-thienyl)cyclohexyl]piperidine binding site (PCP site 2) of guinea pig brain". Synapse. 16 (1): 59–65. doi:10.1002/syn.890160107. PMID 8134901. ^ Large CH, Bison S, Sartori I, Read KD, Gozzi A, Quarta D, Antolini M, Hollands E, Gill CH, Gunthorpe MJ, Idris N, Neill JC, Alvaro GS (Jul 2011). "The efficacy of sodium channel blockers to prevent phencyclidine-induced cognitive dysfunction in the rat: potential for novel treatments for schizophrenia". The Journal of Pharmacology and Experimental Therapeutics. 338 (1): 100–13. doi:10.1124/jpet.110.178475. PMID 21487071. ^ Caddy C, Giaroli G, White TP, Shergill SS, Tracy DK (Apr 2014). "Ketamine as the prototype glutamatergic antidepressant: pharmacodynamic actions, and a systematic review and meta-analysis of efficacy". Therapeutic Advances in Psychopharmacology. 4 (2): 75–99. doi:10.1177/2045125313507739. PMC 3952483. PMID 24688759. ^ Klockgether T, Turski L, Schwarz M, Sontag KH, Lehmann J (Oct 1988). "Paradoxical convulsant action of a novel non-competitive N-methyl-D-aspartate (NMDA) antagonist, tiletamine". Brain Research. 461 (2): 343–8. doi:10.1016/0006-8993(88)90265-X. PMID 2846121. ^ Burns JM, Boyer EW (2013). "Antitussives and substance abuse". Substance Abuse and Rehabilitation. 4: 75–82. doi:10.2147/SAR.S36761. PMC 3931656. PMID 24648790. ^ Aguayo LG, Warnick JE, Maayani S, Glick SD, Weinstein H, Albuquerque EX (May 1982). "Site of action of phencyclidine. IV. Interaction of phencyclidine and its analogues on ionic channels of the electrically excitable membrane and nicotinic receptor: implications for behavioral effects". Molecular Pharmacology. 21 (3): 637–47. PMID 6287200. ^ Zarantonello P, Bettini E, Paio A, Simoncelli C, Terreni S, Cardullo F (Apr 2011). "Novel analogues of ketamine and phencyclidine as NMDA receptor antagonists". Bioorganic & Medicinal Chemistry Letters. 21 (7): 2059–63. doi:10.1016/j.bmcl.2011.02.009. PMID 21334205. ^ Lin H, Vicini S, Hsu FC, Doshi S, Takano H, Coulter DA, Lynch DR (Sep 2010). "Axonal α7 nicotinic ACh receptors modulate presynaptic NMDA receptor expression and structural plasticity of glutamatergic presynaptic boutons". Proceedings of the National Academy of Sciences of the United States of America. 107 (38): 16661–6. Bibcode:2010PNAS..10716661L. doi:10.1073/pnas.1007397107. PMC 2944730. PMID 20817852. ^ Fisher JL, Dani JA (Oct 2000). "Nicotinic receptors on hippocampal cultures can increase synaptic glutamate currents while decreasing the NMDA-receptor component". Neuropharmacology. 39 (13): 2756–69. doi:10.1016/s0028-3908(00)00102-7. PMID 11044745. ^ Prestori F, Bonardi C, Mapelli L, Lombardo P, Goselink R, De Stefano ME, Gandolfi D, Mapelli J, Bertrand D, Schonewille M, De Zeeuw C, D'Angelo E (2013). "Gating of long-term potentiation by nicotinic acetylcholine receptors at the cerebellum input stage". PLOS One. 8 (5): e64828. Bibcode:2013PLoSO...864828P. doi:10.1371/journal.pone.0064828. PMC 3669396. PMID 23741401. ^ Seeman P, Ko F, Tallerico T (Sep 2005). "Dopamine receptor contribution to the action of PCP, LSD and ketamine psychotomimetics". Molecular Psychiatry. 10 (9): 877–83. doi:10.1038/sj.mp.4001682. PMID 15852061. ^ Giannini AJ, Nageotte C, Loiselle RH, Malone DA, Price WA (1984). "Comparison of chlorpromazine, haloperidol and pimozide in the treatment of phencyclidine psychosis: DA-2 receptor specificity". Journal of Toxicology. Clinical Toxicology. 22 (6): 573–9. doi:10.3109/15563658408992586. PMID 6535849. ^ Rothman RB, Reid AA, Monn JA, Jacobson AE, Rice KC (Dec 1989). "The psychotomimetic drug phencyclidine labels two high affinity binding sites in guinea pig brain: evidence for N-methyl-D-aspartate-coupled and dopamine reuptake carrier-associated phencyclidine binding sites". Molecular Pharmacology. 36 (6): 887–96. PMID 2557536. ^ Castellani S, Giannini AJ, Adams PM (1982). "Effects of naloxone, metenkephalin, and morphine on phencyclidine-induced behavior in the rat". Psychopharmacology. 78 (1): 76–80. doi:10.1007/BF00470593. PMID 6815700. ^ a b "Phencyclidine". www.drugbank.ca. Retrieved 28 January 2019. ^ a b c Bey, T; Patel, A (February 2007). "Phencyclidine intoxication and adverse effects: a clinical and pharmacological review of an illicit drug". The California Journal of Emergency Medicine. 8 (1): 9–14. PMC 2859735. PMID 20440387. ^ Johnson, K M; Jones, S M (April 1990). "Neuropharmacology of Phencyclidine: Basic Mechanisms and Therapeutic Potential". Annual Review of Pharmacology and Toxicology. 30 (1): 707–750. doi:10.1146/annurev.pa.30.040190.003423. PMID 2160793. ^ Olney JW, Labruyere J, Price MT (Jun 1989). "Pathological changes induced in cerebrocortical neurons by phencyclidine and related drugs". Science. 244 (4910): 1360–2. Bibcode:1989Sci...244.1360O. doi:10.1126/science.2660263. PMID 2660263. ^ Hargreaves RJ, Hill RG, Iversen LL (1994). Neuroprotective NMDA antagonists: the controversy over their potential for adverse effects on cortical neuronal morphology. Acta Neurochirurgica. Supplementum. 60. pp. 15–9. doi:10.1007/978-3-7091-9334-1_4. ISBN 978-3-7091-9336-5. PMID 7976530. ^ Reynolds LM, Cochran SM, Morris BJ, Pratt JA, Reynolds GP (Mar 2005). "Chronic phencyclidine administration induces schizophrenia-like changes in N-acetylaspartate and N-acetylaspartylglutamate in rat brain". Schizophrenia Research. 73 (2–3): 147–52. doi:10.1016/j.schres.2004.02.003. PMID 15653257. ^ Murray JB (May 2002). "Phencyclidine (PCP): a dangerous drug, but useful in schizophrenia research". The Journal of Psychology. 136 (3): 319–27. doi:10.1080/00223980209604159. PMID 12206280. ^ Lodge, D; Mercier, M S (19 January 2017). "Ketamine and phencyclidine: the good, the bad and the unexpected". British Journal of Pharmacology. 172 (17): 4254–4276. doi:10.1111/bph.13222. ISSN 0007-1188. PMC 4556466. PMID 26075331. ^ Javitt, Daniel C.; Zukin, Stephen R.; Heresco-Levy, Uriel; Umbricht, Daniel (19 January 2017). "Has an Angel Shown the Way? Etiological and Therapeutic Implications of the PCP/NMDA Model of Schizophrenia". Schizophrenia Bulletin. 38 (5): 958–966. doi:10.1093/schbul/sbs069. ISSN 0586-7614. PMC 3446214. PMID 22987851. 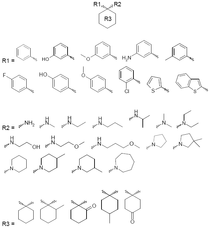 ^ "PCP synthesis and effects: table of contents". www.erowid.org. ^ Itzhak Y, Kalir A, Weissman BA, Cohen S (May 1981). "New analgesic drugs derived from phencyclidine". Journal of Medicinal Chemistry. 24 (5): 496–9. doi:10.1021/jm00137a004. PMID 7241506. ^ Chaudieu I, Vignon J, Chicheportiche M, Kamenka JM, Trouiller G, Chicheportiche R (Mar 1989). "Role of the aromatic group in the inhibition of phencyclidine binding and dopamine uptake by PCP analogs". Pharmacology Biochemistry and Behavior. 32 (3): 699–705. doi:10.1016/0091-3057(89)90020-8. PMID 2544905. ^ Zukin, Stephen R; Sloboda, Zili; Javitt, Daniel C (2005). "Phencyclidine (PCP)". In Lowinson, Joyce H; Ruiz, Pedro; Millman, Robert B; et al. (eds.). Substance Abuse: A Comprehensive Textbook (4th ed.). Philadelphia: Lippincott Williams & Wilkins. ISBN 978-0-7817-3474-5. Retrieved 2 December 2010. ^ Maisto, Stephen A.; Mark Galizio; Gerard Joseph Connors (2004). Drug Use and Abuse. Thompson Wadsworth. ISBN 978-0-15-508517-6. ^ "The Misuse of Drugs Act 1971 (Modification) Order 1979". www.legislation.gov.uk. Retrieved 2016-01-31. Wikimedia Commons has media related to Phencyclidine.